How Managed Is The Conversation On #UniSuper? Bernard Mees, a member of the Consultative Committee of UniSuper, recently published an article in The Conversation. 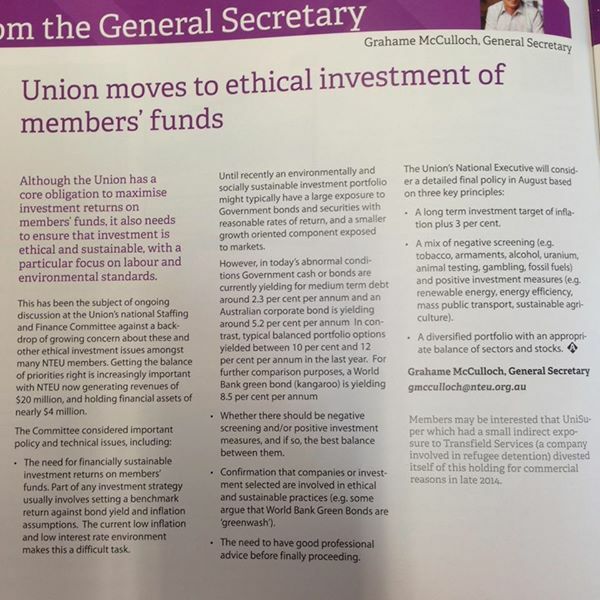 Although the Union has a core obligation to maximise investment returns on members’ funds, it also needs to ensure that investment is ethical and sustainable, with a particular focus on labour and environmental standards. Members may be interested that UniSuper which had a small indirect exposure to Transfield Services (a company involved in refugee detention) divested itself of this holding for commercial reasons in late 2014. This is misleading. Firstly, the wording is a version of a statement that was circulated some months back by Campus Morning Mail. It uses a form of phrasing (“small indirect exposure”) that has become popular among funds as a means to manage members’ perceptions of investment practices. It is important to be clear about what this language means—and does not mean. “Small indirect exposure” simply does not mean that the dollar amounts are small. Whether the investments can reasonably be characterised as “small” when dealing with a $47.8 billion dollar fund is questionable. That is, “exposure” is a fractional, relative term. “Exposure” can become “smaller” due to an increase in overall amounts contained within a fund rather than any decrease in dollar amounts invested in a particular industry. It is therefore possible for “exposure” to decrease while the amount of money invested in detention companies has increased. From the perspective of a divestment campaign, “exposure” has no significance whatsoever, and the amount of “exposure”—as with the term “stand-alone options” that UniSuper has similarly been using to fend off queries about its investments in detention—has no determinate meaning in overall financial or legal terms. A fund is still a single fund for the purposes of legal and financial liabilities, and the impact of particular (bad) investments can and will run through the entire fund, often irrespective of dollar amounts. Used in the context of fund investments, “exposure” and “stand-alone options” are marketing terms. They are a means of managing the risk (to the fund) of people calling on that fund to divest from unethical industries. The term “exposure” comes from theories of financial contagion, and its use in this context verges on the nonsensical. The article carried by Campus Morning Mail also contained blatant errors of fact regarding Transfield’s corporate arrangements. Thirdly, UniSuper have admitted they continue to invest in Serco, Decmil and unspecified other companies involved in the detention industry, and have plainly not stated that they will not re-invest in Transfield at some future date. Some time ago, we were approached by someone from the NTEU and encouraged to declare this a win for the NTEU and the divestment campaign. We do not see how this is plausible or in the interests of divestment. At best, such declarations serve to stall the momentum of the divestment campaign by sowing confusion [see also note 2 below]. The NTEU has a policy to pursue divestment from the detention industry as a whole, not protect UniSuper from pressure to divest. Moreover, while some continue to shield the detention industry with invocations of fiduciary duty and abstract fealty to ‘investment maximisation,’ we have pointed out that there is scope within conventional ethical investment guidelines for fund managers to exclude an entire industry based on its predictably causing harm. Still, making rather than losing money from investments in an extremely, predictably, damaging industry (as with tobacco and landmines) is not plausible grounds for continuing to invest. UniSuper would not seek to claim that they should invest in tobacco (which, as with detention, is legal) so as to make that industry “more socially responsible.” That UniSuper have argued this line repeatedly in the past suggests that they are unlikely to divest of their own accord unless pressured to do so. Far from being a symbolic act, as some have suggested, divestment involves withdrawing millions of dollars effectively loaned to the detention industry at rates far below those of any bank loans. Divestment is a far more practical step in the campaign against mandatory detention than most, and it is undoubtedly why it is being met with some resistance and the fomenting of confusion. Finally, as some of us are members of both the NTEU and have funds with UniSuper, we call on the NTEU, and its representative on the Board of UniSuper, to give an accurate account of the precise steps they have taken, and will take, to ensure further and verifiable divestment from the detention industry. In the meantime, we will endeavour to provide accurate, credible and independent advice on how to kick over the financial props of the detention industry. 1. As we noted in the divestment brochure, the Chair UniSuper’s committee tasked with deciding on UniSuper investment policy and the appointment of investment managers is also the Chair of Argo Investments. As per its most recent available Annual Report, Argo held a $4m stake in Transfield and a $15m stake in Toll Holdings. It is quite likely that were UniSuper to divest completely from the detention industry, it would impact the value of investments held by others. Well, good. And good investment managers should be capable of planning for change as a matter of course. 2. Prior to this, we were informed late last year that the NTEU—despite its own policy—was “backing away from divestment” and, instead, would undertake unspecified “other kinds of actions” around the issue of refugees. Subsequently, two NTEU staff members, presumably responsible for working on refugee issues, emerged as key organisers of the “hunger for justice” action, and bizarrely they organised this event using our name. We did not organise this event nor did we endorse it. We have since been led to understand that others did endorse it because they thought we had organised it. As far as we can tell, the only tangible outcome of “hunger for justice” was constructing a media platform for the promotion of politicians from parties that support mandatory detention. These same organisers subsequently, and inaccurately, implied to journalists that they had organised other actions, such as those at recent sporting events, the sky-writing actions over Canberra and Sydney, and anti-deportation actions.